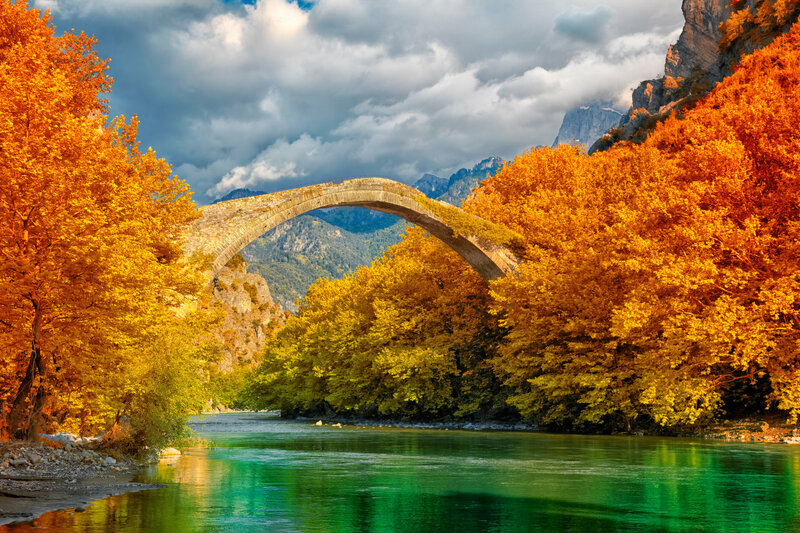 There are more than 1,500 awe-inspiring, breathtaking arch stone bridges around Greece, so we had to make a hard decision in choosing the most impressive ones you should not miss while exploring mainland Greece! Choose your hiking trail wisely; not all bridges are going to connect you with the other side.. Most of them are built in wild, stunning landscapes and stand as architectural masterpieces of superb craftsmanship. They are associated with legends and local traditions, which will take you on a trip back to history of each destination! To find them, you may have to swim in rivers, trek alongside the riverside, follow well-hidden or marked hiking trails or just some village roads. On your way, do not get surprised if you come across any flock of sheep or goats! This arch stone bridge was built in 1870 in a beautifully serene place with the Aoos river flowing peacefully under its arches. It has a spanning of 40m and a height of 20m. It is located southwest of Konitsa town at the end of Aoos river, where it is narrowed. One of the characteristics of this bridge, beside its size, is an iron bell, located under the mid span of the bridge, that warned people of strong winds that made their crossing dangerous. This single arch stone bridge with the elongated arch was built in 1853 and is maintained in good condition until today. It is located in Klidonia Village at the end of Vikos Gorge and bridges Voidomatis river, famous for the striking natural beauty and its crystal clear waters. 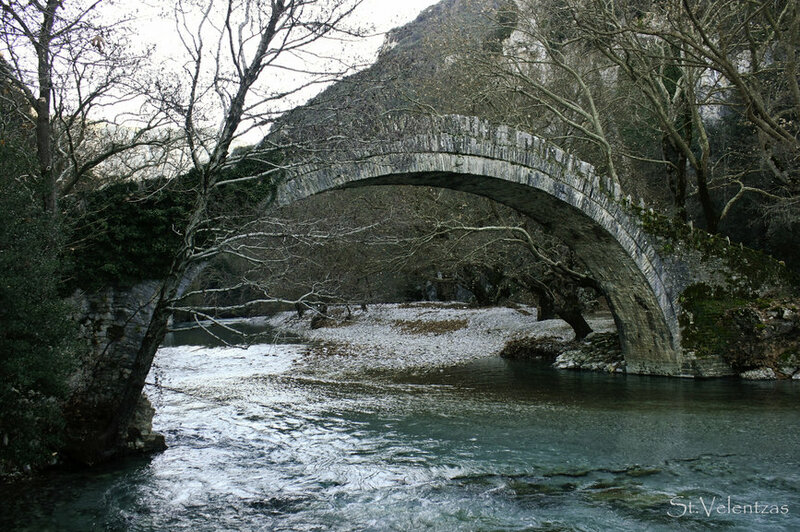 Walk over the bridge and enjoy the beutiful views of Voidomatis river. Plus, find out more about the legend of a bloody episode that took place there between two families for reasons of honor. Originally built out of wood, it was converted into stone in 1814 at a cost of 20,000 “grossia” by the abbot Seraphim of Prophet Elias monastery in Vitsa. This is why it is named “kalogeriko” meaning “monkish”. This is one of the most impressive bridges of the area, as it is a triple arch one, 10.5, 12.5 and 14.4 meters in length and 3.65, 6.10 and 5 meters tall, respectively. Its other name “Plakida” was originally used after 1865, when members of the Plakida family financed its maintenance. It was repaired in 1950 by the community of Koukouli villzge and later by the Archaeological Society. The bridge served mainly the people of Koukouli village to move their goats and bring wood. It also connected the inhabitants of the opposite villages who came to grind at the mill. 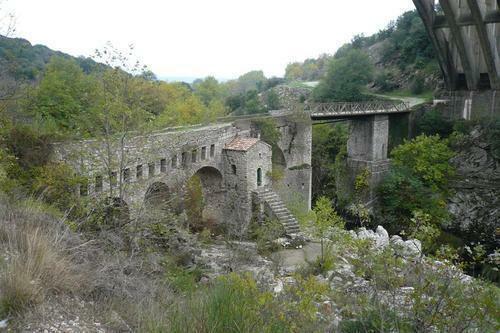 This is a single arch stone bridge, built in 1659 between the villages of West Fragista and Longitsi. 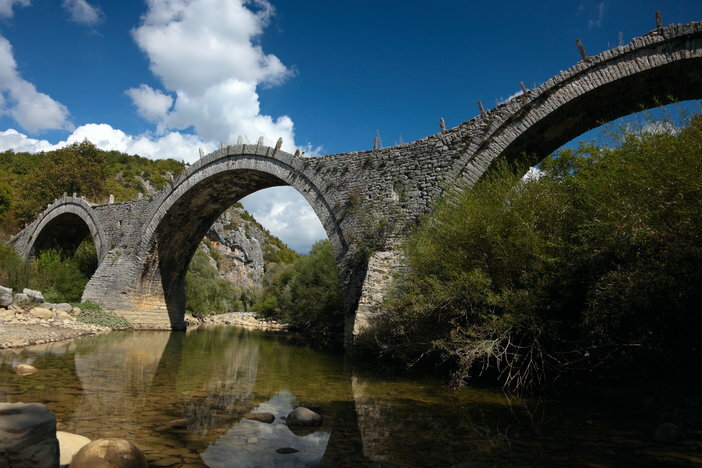 With an arch of 30m long and 22m high, it is the last bridge of Agrafiotis river, located just before the old confluence of three major rivers of the region, Acheloos and its tributaries, Agrafiotis and Megdovas. It actually marks the exit of the river at Lake Kremaston. The bridge took its name from its creator, Manolis Chrysiotis. According to the tradition, being a childless couple with his wife, he decided to create a “child”(the bridge). It was used continuously for 3 centuries as the only passage from Karpenissi to western Central Greece, until the construction and creation of Kremaston Lake during the 60s. Since then, the water level rose and Agrafiotis river expanded, but this unique monument has not lost its glory. It can no longer serve hikers, but became a very special attraction, a sight that is never the same, as the water level changes constantly. The bridge is located in the wider area of Agrafa mountains that are divided into “Roumeliotika Agrafa” and “Thessalika Agrafa”. The term “Agrafa” (which means “Blank”) include both the northern part of Evritania and the southwestern part of Karditsa Prefecture (or more specifically from Karpenisi to Lake Plastiras). They call it Agrafa due to the fact that these mountains have never been mapped; they were deliberately left out. Due to the wild peaks and steep slopes, the area had never been occupied by the Turks and they enjoyed tax exemption. The Noutsou bridge (or Kokkori, as it is also known), a single arch stone bridge, is located in central Zagori, between the villages of Koukouli, Dilofo and Kipoi, just 39 km from Ioannina. Noutsos Kontodimos, from Vradeto village, financed the construction of the bridge that took its name in 1750. It had to be repaired or even built from the beginning many times. Many people participated in its maintainance, such as the miller Grigoris Kokkoris from whom it took its second name. The bridge is a very immpresive one and you cannot pass by it, without stopping to admire it! 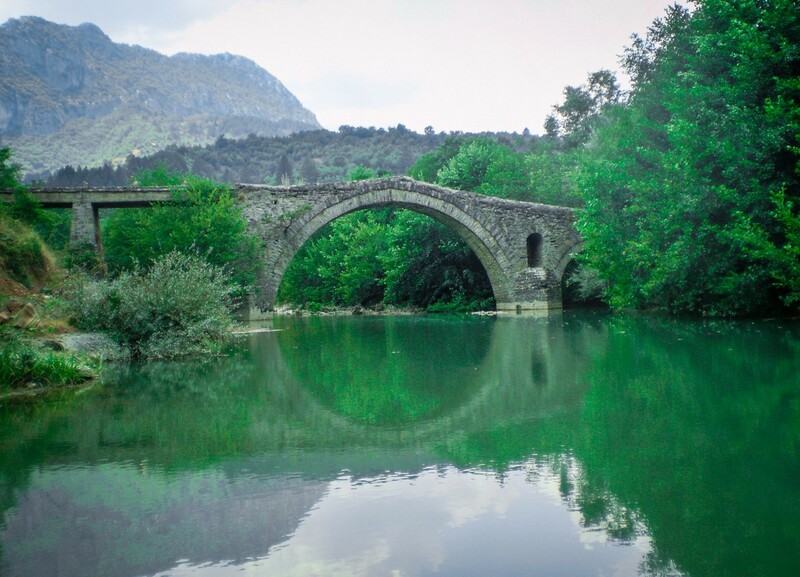 Do not miss the opportunity to walk across the bridge and enjoy the beautiful views over Voidomatis river. 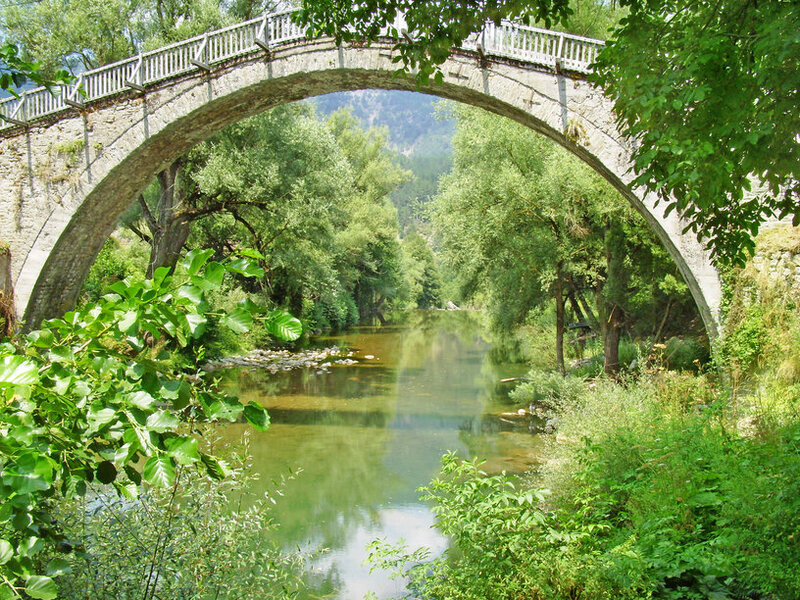 The bridge of Portitsa is a two-arched stone bridge, located near the mountainous village of Spileo in Grevena prefecture. It was constructed in 1743 with money from the monastery of Spileo and can be reached either on foot, following the paved path from the village or by car, following a dirt road, which also starts from the village. It is undoubtedly one of the most beautiful and “popular” bridges in Grevena, because of the two impressive tower cliffs at the entrance of Portitsa gorge. Its big arch has a width of 13,80m, while the small one has a width of 5m. Its total length is 34m and its height 7,80m. 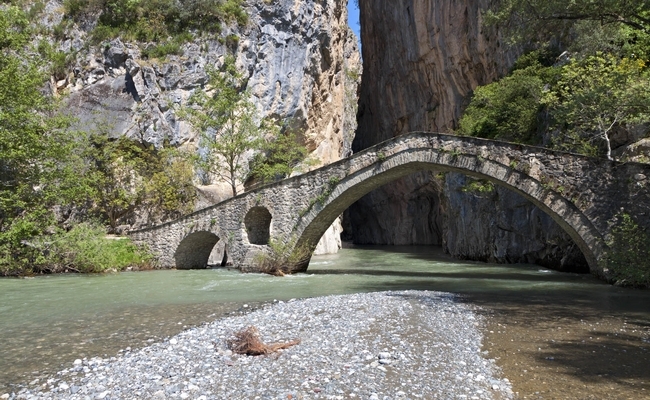 Venetikos river flows under the bridge, which is a tributary of Aliakmonas, the longest river in Greece. This bridge is located in the center of Vovousa village and is one of the most impressive and important bridges of Zagori. It connects the two sides of the village, which is built on both banks of Aoos river at 1.000m altitude and seemed to be cut in two parts. The bridge was constructed in 1748, sponsored by Alexis Misios from Monodendri village and was last modified in 1936, when they installed wooden fences for the protection of bystanders. It is a single arch bridge, with 22m length and 11m height, located in an area surrounded by dense, impenetrable forests with beech, fir and pinetrees. 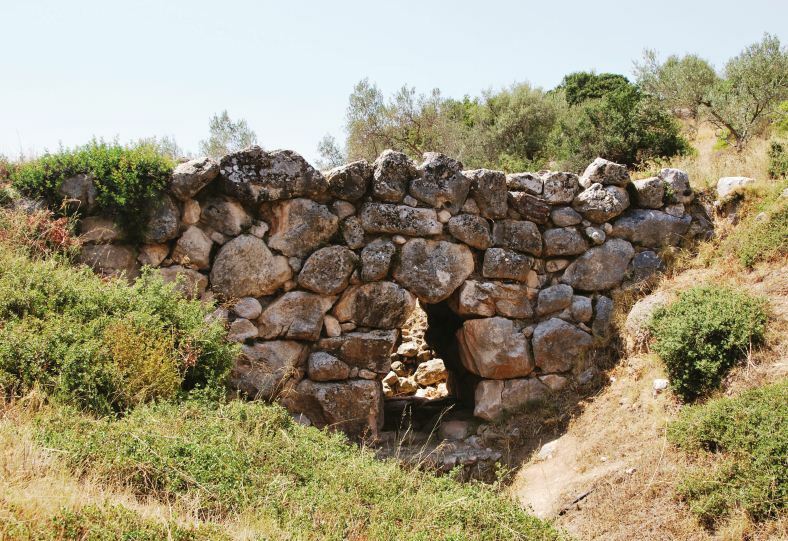 Mycenean bridge of Kazarmas is the oldest bridge in Europe, dating back to the 13th century BC. It is situated along a well-built Mycenaean road which linked Mycenae, Tiryns and Epidaurus and help commercial and military movements. It was built of limestone boulders without binding materials in the characteristic Mycenaean masonry called “Cyclopean”, a wonder not to be missed as it is still standing and used even today by the local residents. 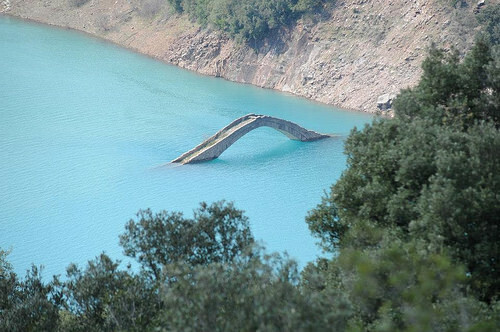 This is one of the oldest bridges in the Peloponnese, located over Alphios river, right below the historic town of Karitena. It consists of five unequal arches, has a height of 12m, a length of 50m and the largest arch has a span of 8.75 meters. According to the legend, local hacraftsmens built a princess of the Franks in the foundations of the bridge, back in the medieval era – around mid 13th century, when the first bridge was built. In the Late Byzantine era, the bridge took its present form, with several rectangular openings. More specifically, it was reconstructed in 1441 by Raul Manuel Melik, descendant of an important Byzantine family. The story says that Raul Manuel tried to cross the river, but he almost drowned, because the old bridge was almost destroyed. This is why he decided to reconstruct it. On the one side of the bridge, there is a chapel dedicated to the Virgin. 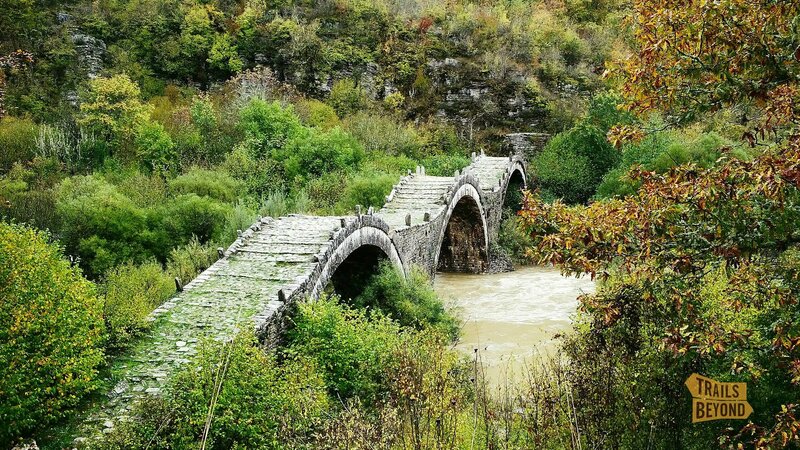 This three arched stone bridge bridges Velonia river, one of the two tributaries of Venetikos river. It is located between the villages of Mavranei and Spileo and was built around 1.800 (the exact date is not known). The total length of the bridge is about 50 meters and its width is 2,60m. Its middle arch, the bigeest one, is 7m high. Nowadays, only two of the three arches are maintained; the south arch has been destroyed.